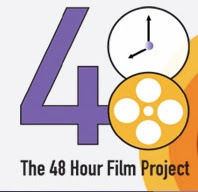 This week's free movie - Clonely - is a short film written, shot, edited and scored in a mere 48 hours as part of the 2008 Chicago 48 Hour Film Project. It's the story of a lonely widower who has his dead wife cloned, but who finds she really isn't the same woman he married, even though their daughter (his daughter?) seems happy to simply have her mom back. Clonely (Science Fiction) from Jerry Vasilatos on Vimeo. Created by Jerry Vasilatos and Nitestar Productions, the movie won an award for "Best Use of Line of Dialogue" ("What's the password?"). The other required elements for the film were a Character "Walter or Wilma Western, Repair Person" and a prop "urn or container with a deceased's ashes". I'm not sure if I'd consider the story to have a happy ending or not. It reminds me a bit of the stories you read about wealthy folks who spend huge sums of money to have their dead dog or cat cloned. The replica is never going to be the same as the original. I can't imagine that a human clone would not be able to fill the hollow place left when a loved one leaves us, although I can understand how tempting it might be if that option were available. Ultimately, isn't better to move forward with your life than to try to replicate the past? And who's your favorite actor? George Clonely!